Designer Estelle Calafato founded the brand SUNDRESS after finishing fashion school in Paris where she began her fashion career with Nina Ricci. In 2013, Estelle moved back to her hometown in Cote d’Azur and launched the brand SUNDRESS using inspiration from her travelling experiences. SUNDRESS collection is sophisticated yet casual and chic. The design concepts are both functionally and aesthetically versatile. The garments incorporate easy-to-wear transitional pieces with a glimpse of colourful hand embroidery details that add personality and solid brand image for SUNDRESS. The colorful color palettes give off a fun and playful vibe for the garments. 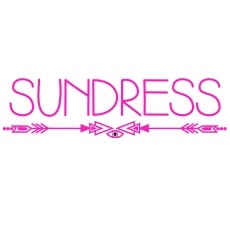 SUNDRESS is more than just a brand; it’s a lifestyle and community that represent the world of wanderlust. The Sundress girl is a barefoot gypsy, with a free spirit and wild heart. She is an amazon who is always looking for new adventures – to travels and explores the world. Her style is effortlessly chic, colorful and playful yet bold and feminine.